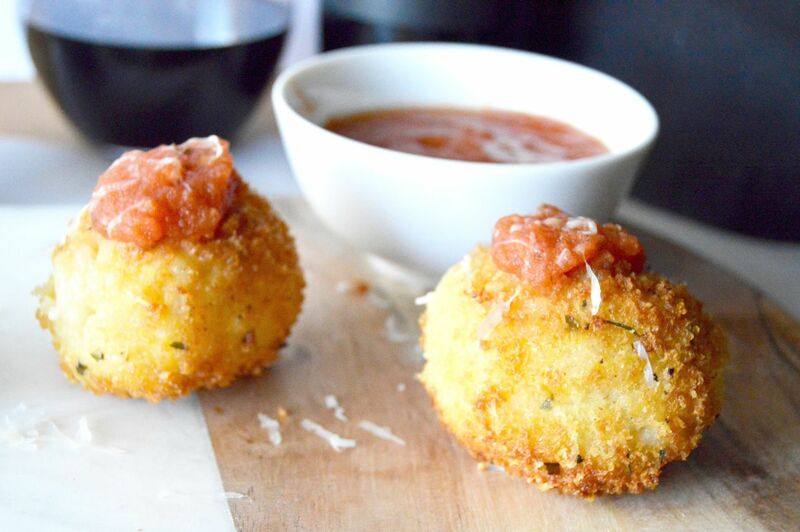 Gruyere Salami Risotto Balls (Arancini): An easy appetizer to make from leftover risotto. These Arancini balls are filled with a melty, stretchy Gruyere cheese and a spicy salami. Those are surrounded by risotto that is rolled in panko and fried for a crunchy bite of deliciousness! My blog is officially 2 years old. Until 8 months ago it was just a fun thing for me to do whenever the fancy suited me. Then I found out I could do so much more with it. I met some amazing people in a Facebook group of all places that were able to create a business out of blogging. Suddenly it opened up a whole lot of ideas of things I could do to be able to do something full time that I could make a living at that I absolutely loved. I mean who wouldn’t want that right? Making a living is a ways off, but it’s going in the right direction. The first thing I had to do was focus a little bit more on what I wanted to write about. 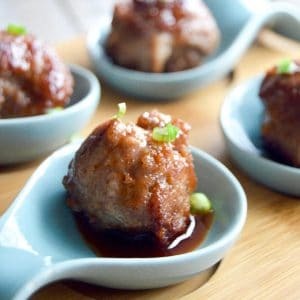 In looking at my most successful posts I saw that appetizers, cocktails and smaller portion(plates) did well. I’ve been looking back at the beginning of my blog at some of the full meals that I shared and am going back in and creating a companion two-fer meal for it. Gruyere Salami Risotto Balls otherwise known as Arancini is a 2-fer meal for the Parmesan Mushroom Risotto. I basically made 2 servings of the risotto and held out the mushrooms to make a second meal of Arancini. 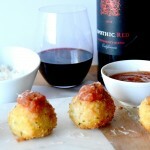 Gruyere Salami Risotto balls (Arancini) fit both of my primary focus categories in my blog. They work as an appetizer and 2-fer meal. 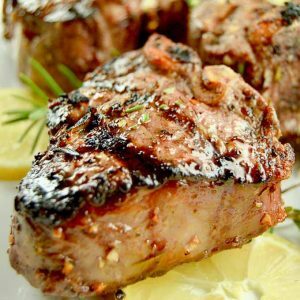 Honestly, they are great for a weeknight meal as well if you serve it along side a nice crisp salad. They are very simple to make… really. Here is a simple photo “how to” for easy understanding of how to make the risotto ball. The secret is to make sure you wet your hands before you start assembling them. If you do this then the risotto will NOT stick to your hands and you will get a nice round ball. I serve these with a simple tomato sauce, but my husband will eat them without a sauce. I usually serve them with a nice Riesling, since that is what I use to make the risotto. But they work equally as well with a red wine such as Chianti or a Grenache. Both of those reds tend to be a little lighter so it counterbalances the Risotto Balls that are so filling. LOOK AT THAT MELTY CHEESE! YUM!! These were such a success in our house and for a recent get together I’m already working on a new recipe for some different fillings! Gruyere Salami Risotto Balls (Arancini): An easy appetizer to make from leftover risotto these Arancini balls are filled with a melty, stretchy Gruyere cheese and a spicy and salami. Those are surrounded by risotto that is rolled in panko and fried for a crunchy bite of deliciousness! 4 ounces Salami cut to small pieces. Prepare Risotto 8 hours ahead from Mushroom risotto recipe listed above, but omit the mushrooms. The risotto can also be made the night before making these balls. In a small bowl place panko, salt, oregano and remaining 1/2 cup of Parmesan cheese and mix well. Heat a skillet to high, then add vegetable oil and reduce the heat to medium high. Wet your hands with water then scoop a golf ball sized amount of risotto mixture into your hand and press flat. Using your thumb, make a small indention for salami and gruyere to go. Place a couple of pieces of salami and one piece of cheese in the indention. Slowly round up the sides and form a ball around the cheese and meat. Place on a plate and continue making the rest of the risotto into balls until all risotto used. Once all the balls are made, place the balls one by one into the panko mixture and coat evenly. Because of the egg binder, the panko sticks quite easily. Roll all balls in panko until all have been completed. At this point you can either place under plastic wrap and place in fridge for up to 1 day before frying or you can fry immediately. When ready to fry, turn on heat to medium high and get oil hot enough that when you drop a piece of panko into it, it immediately sizzles. In batches with plenty of room in between them cook for 8-10 mins until all sides are golden brown. Once all sides are golden brown, place on paper towel and place in 250° oven until all are ready to serve. Serve alone with fresh parmesan sprinkled on top or with your favorite tomato sauce to dip into. Note 2. By sautéing the salami in the oil you are going to cook the risotto balls in, you are adding an extra boost of flavor to the finished balls! Time to make recipe doesn't include making of the risotto recipe. See recipe for that information. Happy 2 years! And mmmmm I love risotto balls! I first discovered these when visiting an Italian deli in NYC Little Italy. They had a large tray of these sitting by the checkout. It was instant love! Your beautiful photos prompts me to make some soon. Thanks. These look quite tasty, and sound so savory and delicious! I had not heard of risotto balls before, and the idea of adding something to the center is inspired. Congrats on your two years of blogging! Those look absolutely delicious! I know my family would love them. Pinning! Congratulations on your 2 year anniversary! Also big congratulations on your rebirth and 6 month anniversary! I love your recipes and photos! 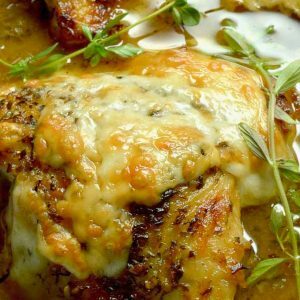 This is a wonderful way to use up leftover risotto! I bet you could also freeze these prior to cooking to add a 3-fer! I am pinning these because they will be made with my next batch of risotto! Delicious! These Risotto Balls look delicious. I was actually watching Top Chef last night and one of the chefs made risotto. I commented to my husband that I would love to make it and try it. gruyere-salami-risotto-balls!!!!! such a great idea!!! love! I like how you put thought into the recipe post and not only gave step by step instructions but kind of like a guide to eating it as well! Great recipe! these look like they would be really good. It would be a perfect appetizer for a cocktail party or holiday celebration as well. Congratulations on 2 years blogging! That is a great accomplishment! 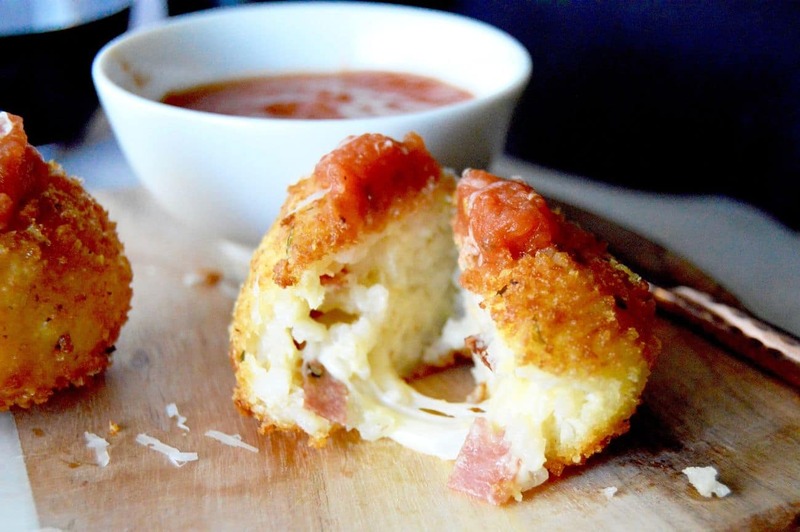 These risotto balls look delicious! I am going to have to try them. I have never made risotto before. Oh these look delicious. I love the combination of melty cheese and salami. Looks like a great appetizer for a party. This makes me think of my daughter because she loves salami. I never thought to use risotto for a ball recipe. These sound really delicious! Perfect for appetizers. these looks amazing! I wonder, can you put a bit more salami in the middle – I think I would like a bit more in my bite. We love salami in my home! I think you may have something there…. a diced piece of salami would be good too! Looking forward to watching your blog grow and hopefully a taste test or two…or more! Oh my gosh. These sound amazing! I have just ventured into making risotto and I think this needs to be next on my list! Congrats on two years of blogging 🙂 Love the risotto ball recipe, looks so good. Those look so good, I think I’d really like them! I love anything with cheese. Also, happy blogiversary! I would have it without meat because I am a vegetarian but this looks delicious! Look at that melting cheesy and crispy breadcrumbs! i love gruyere cheese and my kids love salami. i think it’s time to introduce the two! I have never tried risotto or gruyere cheese to be honest with you. This looks like it would be quite delicious! something new to introduce to myself and to my kids. These are sooooo good! Like kinda like friend mac and cheese. Cheesecake factory sells them and I order them all the time. Thanks for the post. Oh I’m so glad I came across your blog today–I absolutely needed something like this to make for the kids!! deliciously stunning! I could eat those every single day! I would love to make these – they sound so good. What an amazing appetizer! So creative!! This will be a big hit at my next dinner party! These look amazing!!! I’m so in with the salami and gruyere cheese!!! Thank you for sharing. Perfect for leftover risotto! And the kids will love the stuffed cheese. Did someone say cheese? 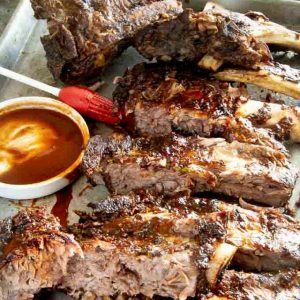 I totally need to make this recipe this week! Our family would love this!